Minimum order is 12 bottles of any wine, spirit or sparkling - choose 12 of the same or select up to 4 choices, 3 bottles minimum of each choice. Each subsequent case must total 12 bottles. Minimum Order to Checkout is 12 bottles, or Multiples of 12. Orders Despatched Next Working Day or Tell us your Preferred Delivery Day Mon-Fri via the Special Instructions Box. FREE Delivery Mainland England and Wales. FREE Collection from Distribution Centre. Scottish Mainland £6 one off surcharge - we make nothing on this, sorry to pass it on. New to Paul Roberts Wines January 2018. 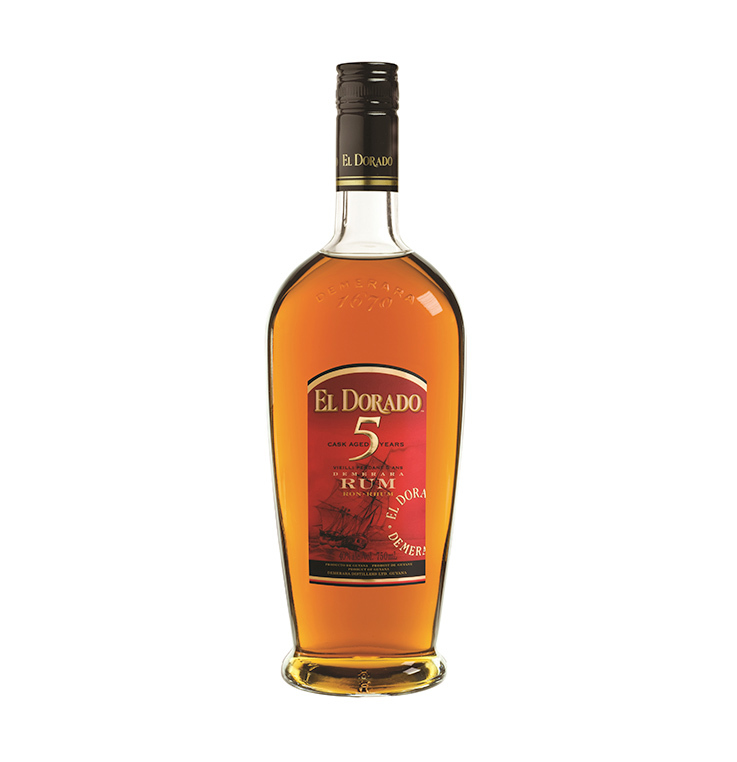 El Dorado 5 Year Old Demerara Rum is amber in colour and spirited with a dried tropical fruit nose. A vibrant entry leads to an evolving palate of fruit, caramel and toasted coconut fading to a vanilla tinted glow. Remarkably developed and complex for a relatively young rum which can be enjoyed mixed into a variety of delicious cocktails. A versatile, golden 5 Year Old made using the world’s only wooden Coffey still. 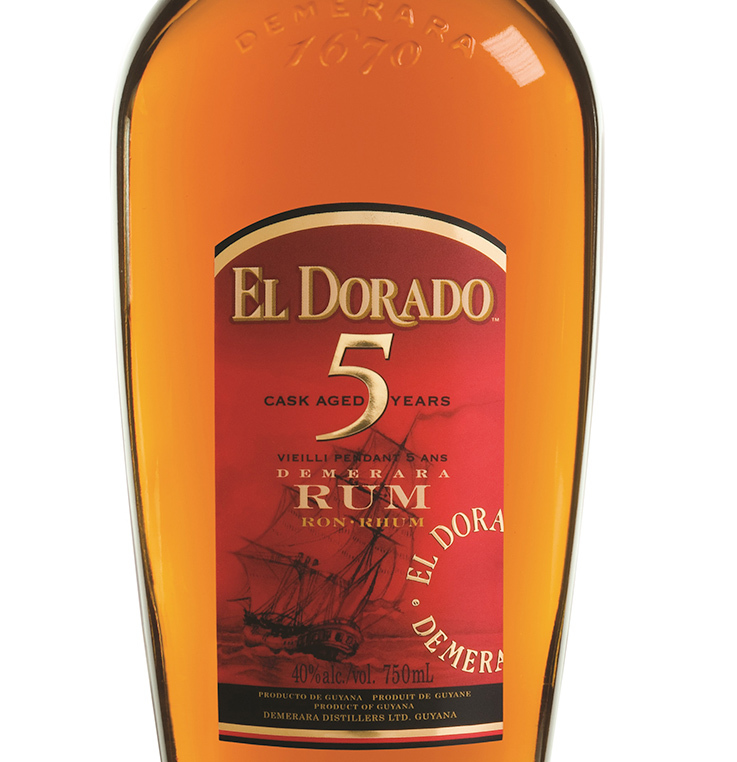 El Dorado 5 year old was awarded with the prize for “Best Golden Rum under 6 Years Old” at the 2010 Golden Rum Barrel Awards, was voted the ‘Best Pouring Golden Rum’ in Imbibe magazine in 2011, and won a ‘Best in Class’ medal at the 2011 International Wine & Spirits Competition. In a highball glass, add 50ml El Dorado 5 Year Old, 25ml freshly squeezed lime juice, a dash of bitters, 30ml pineapple juice and 10ml sugar syrup. Fill up glass with crushed ice and swizzle. Add more ice and pineapple juice if necessary and garnish with a lime wedge. Currently there is no customer reviews for this product.